Your conference is finally here! The months of planning every last detail boil down these one or two days. The venue is set, you've created a catchy event hashtag, now it's time for your attendees to arrive. To prevent your hard work from going to waste, we've compiled a list of some of the most important items to have waiting for conference-goers as they walk into the venue, ready to network, learn, and have fun. Gift Bags - One way to leave a big impression on your attendees is to give them gifts! Keeping your budget in mind, give attendees items that are useful like USB sticks or flash drives instead of things that they'll have to cram into their suitcase or, worse, throw away. Reach out to local businesses and include items that represent the location of your conference. Charging Stations - With the rise of conference technology, including event apps, you don't want your attendees struggling to power up their devices. Make sure you have dedicated areas so that everyone can stay informed and post about what a great time they're having at the conference! It also makes a great spot for people to network as they wait for their battery to charge. Great Food - We've said it before: a delicious menu is crucial to the success of your event. 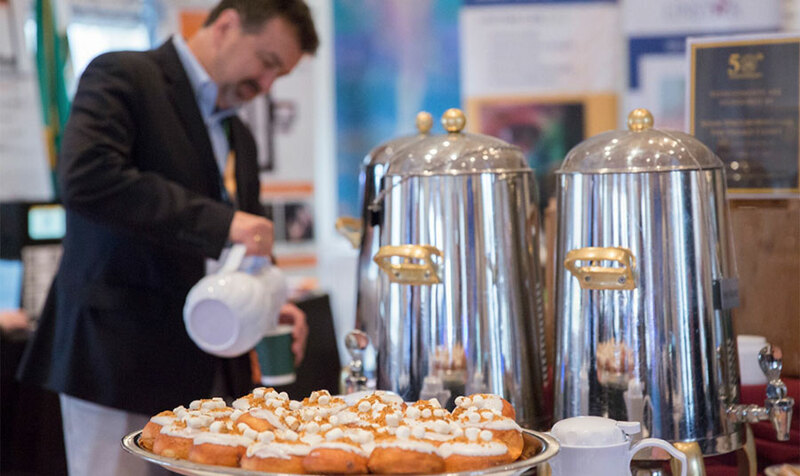 When planning the menu, don't forget to have coffee and other snack foods available as your attendees move to different breakout sessions. You want everyone to focus on the fabulous speakers you've lined up, not worrying about when they'll eat next. Office Supplies - While your venue will no doubt have things like pens, post-it notes, markers, and tape on hand, keep a box at your registration table for those moments when you need something quickly. Event Staff - Event management software is a great tool for reducing the number of frequently asked questions that plague your staff, and slow down the registration process. However, be sure you have people on hand who can direct attendees in the event they're unable to access information online. Complimentary Wi-Fi - With so much of the conference experience online, you want to make sure that your participants have free, high speed wi-fi. No longer an amenity, wi-fi is an integral part of the conference experience, and attendees won't look kindly on having to pay for access. Event Agendas - Yes, the schedule of events for your conference is on the website. And, yes, it's available on your event app. Keep a stack of agendas on hand for the attendees who request a hard copy of which breakout sessions or keynote speaker they'd like to attend. These a re just a few items to keep in mind as you prepare for your annual conference. Anticipating your attendees' needs is a big undertaking, but with proper planning and The Otesaga's experienced staff, your conference will go off without a hitch. Contact us today to see how we can help make your event a complete success.